This music clip is from the CD entitled "Just Us". 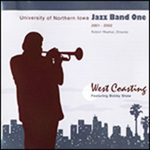 The band was directed by Dr. Robert Washut. "Basso Urnessto" (1999). Jazz Band One. 130.